Don't let the whole grain fool you - these puppies are sweet and rich enough to satisfy even the most ravenous sweet tooth (i.e., mine). Preheat oven to 350 degrees. In a medium-large bowl, stir together dry ingredients (flour, oats, baking powder, and salt). In a separate large bowl, combine wet ingredients (canola oil through vanilla). Add dry ingredients to wet ingredients and stir to combine well. 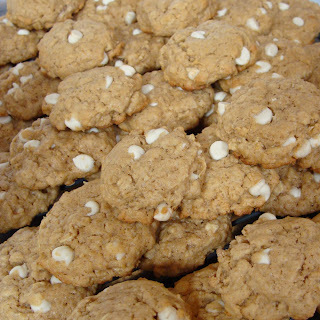 Add in white chocolate chips and mix until incorporated. Scoop onto greased cookie sheets, flatten slightly, and bake for 12 minutes, or until lightly browned around the edges.